Keep parents informed about what their child is learning from God’s Word. Use these templates to customize your own newsletter. Just add the name of your church or children’s ministry, then click and highlight the modifiable areas to change the text. Looking for fun holiday or seasonal ideas to use in the classroom? These craft ideas are simple, festive, and sure to be a hit! Teachers and volunteers can lead kids to a personal relationship with Jesus—and the Leading Young Hearts to the Lord pocket guide offers guidance. 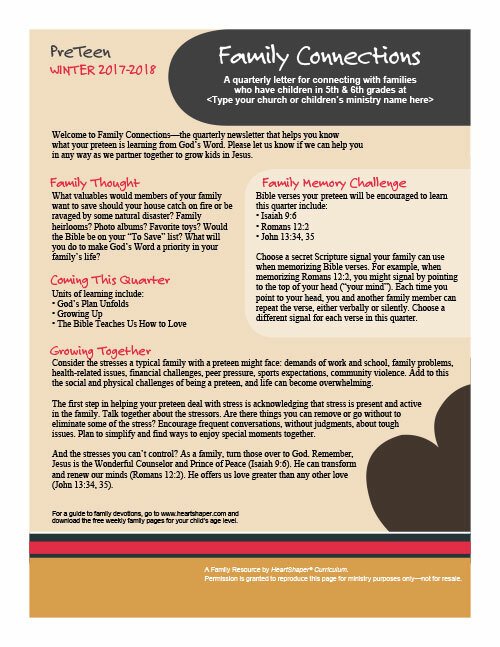 This pamphlet is available on each quarter’s Resources CD and by download. For Early Elementary, Middle Elementary, and PreTeen. Puppets are integrated in Toddlers & 2s, Preschool, and Pre-K & K lessons to help teach meaningful Bible truths and engage children in Bible learning. 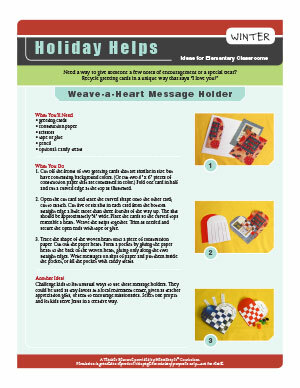 Use these patterns to create puppets you can use with your HeartShaper lessons. 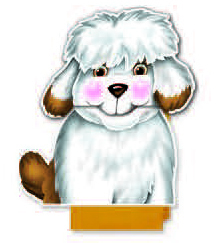 For Toddlers & 2s (Teddy), Preschool (Scout), and Pre-K & K (Scamper).